This meal is by far the simplest meal on the blog—it can literally take under five minutes to prep! If you are literally too tired to chop garlic, or even to call in for food delivery, this is the meal for you. Also, it can be made with just a few items you probably keep on hand. Beans can be a staple food for those trying to lessen environmental impact. Not only do they have low carbon, nitrogen, and water footprints, functionally, they can replace foods with much higher impact, such as beef. So, for a while, I’ve been on the lookout for a delicious and simple bean recipe for days when I am really squeezed for time. I wanted a meal that I would really look forward to eating, that would be healthier than take out, but wouldn’t require much energy. This recipe was a success for the whole family! This meal is by far the simplest meal on the blog—it can literally take under five minutes to prep! If you are literally too tired to chop garlic, or even to call in for food delivery, this is the meal for you. Also, it can be made with just a few items you probably keep on hand. Beans can be a staple food for those trying to lessen environmental impact. Not only do they have low carbon, nitrogen, and water footprints, functionally, they can replace foods with much higher impact, such as beef. So, for a while, I’ve been on the lookout for a delicious and simple bean recipe for days when I am really squeezed for time. I wanted a meal that I would really look forward to eating, that would be healthier than take out, but wouldn’t require much energy. This recipe was a success for the whole family! Bring to a boil, and then simmer until heated through and the flavors have had a chance to meld with the beans. Serve with a grain and a simple salad for a quick and very satisfying meal. 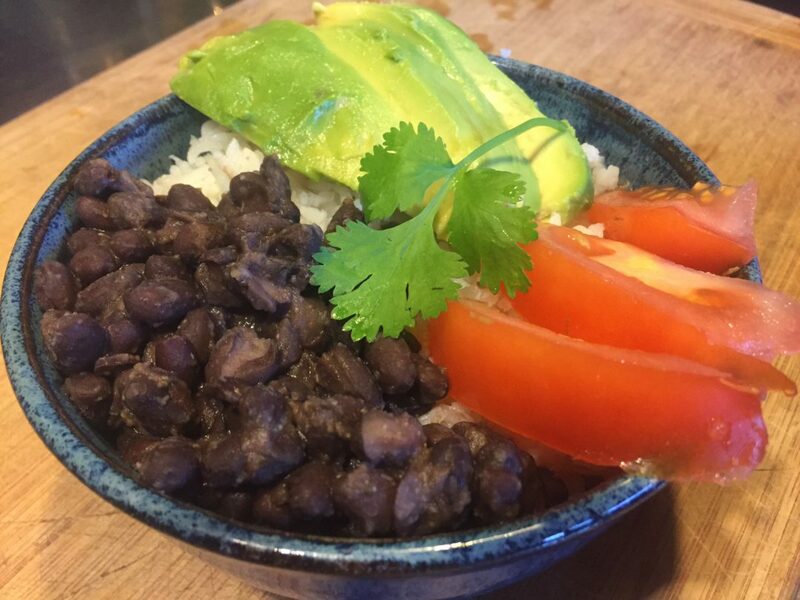 We most recently had these beans in a great bowl with rice, avocado, and tomatoes. If you don’t have rice, or are trying to increase your greens, just serve these beans along with greens. Add hot sauce and/or lime, as you like. This only serves 2-3, so make sure you double it if necessary. 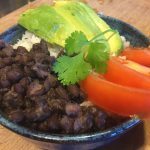 For a serving of this rice bowl, which has a total of 325 calories, the carbon footprint is 254 g CO2-eq, with 96 g CO2-eq coming from the rice, and 66, 64, and 27 g CO2-eq coming from the beans, avocado, and tomato, respectively. A similar meal also totaling 325 calories but using beef chili instead of the beans would have a total of 2449 g CO2-eq, with 2261 g CO2-eq coming from the beef! Switching from the beef chili to the beans one time save the carbon equivalents emitted in a 9.9 mile drive (assuming 40 MPG)! Doing a simple shift like this everyday for a year adds up to avoiding the emissions in driving across the country!! The nitrogen footprint of the whole beans and rice meal is 3.2 g N per serving, with 1.4 and 0.8 g N coming from the beans and rice, respectively. For comparison, the beef chili results in a N footprint of 21.9 g N, with 20 g N coming from the beef. There is bit about nitrogen cycle on the Science page of this blog, and the N footprint website is a great resource. The water footprint of the bean and rice bowl is 325 L per serving, with 145 and 111 L coming from the beans and rice, respectively. The beef chili meal has a water footprint of 745 L per serving. Those extra 420 L are equivalent to running the shower for 44 minutes with a standard shower head, or an hour and 14 minutes with a low flow shower head! If you are worried about flatulence, your body should adjust to increased legume intake. A 2011 study compared gas production over an eight-week period in groups given added beans compared to controls and found that during the first week, 35% of the bean-consuming participants reported increased gas, but this number steadily decreased throughout the duration of the study, reaching 5% by week 5, and 3% by week 8 (Winham and Hutchins, 2011). Some tips to reduce gassiness: If you are using canned beans, rinse before using. If you are cooking them from dry, make sure to soak and cook them long enough, and discard the cooking water. 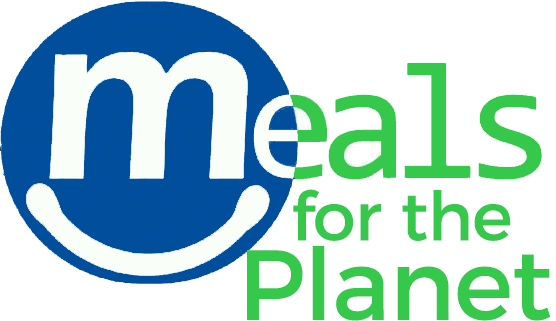 Please follow the blog for weekly recipes with low environmental footprint!